Sullivan & Cromwell provides superior legal representation to U.S. and non-U.S. corporations, financial institutions and individuals in the most notable securities litigations and arbitrations worldwide. S&C's lawyers have played a fundamental role in the evolution of U.S. banking and securities law and are well respected by courts, regulators and adversaries. internal investigations conducted by corporations and their boards of directors. S&C is noted for representing financial institutions and other clients in matters arising out of the subprime lending crisis, including many nonpublic investigations of events in the subprime securitization market. S&C helps clients manage investigations and enforcement actions brought by the SEC and other regulators, often concurrently with private litigation. These investigations and lawsuits often involve allegations of false or misleading disclosures to shareholders, insider trading and other types of financial fraud. S&C has also successfully represented corporations in shareholder derivative and class-action litigation arising out of corporate control disputes. The Firm's securities litigation practice is coordinated among four U.S. offices and S&C's London office. S&C is one of very few U.S. firms with an established U.S. law litigation practice representing U.S. and non-U.S. clients. BP and its directors, in securities litigation arising out of the 2010 Gulf of Mexico oil spill. To date, S&C has achieved dismissals in many of these actions including derivative, Employee Retirement Income Security Act and other shareholder litigations. Barclays, in international, multiagency investigations into benchmark interest rates, including the London Interbank Offered Rate (Libor) and the Euro Interbank Offered Rate (Euribor). S&C was engaged by Barclays to conduct an internal investigation regarding conduct relating to benchmark interest rates. In 2012, Barclays entered into settlements with the U.S. Commodity Futures Trading Commission, U.S. Department of Justice Fraud Division and the U.K. Financial Services Authority. S&C also represented Barclays in obtaining conditional leniency from the Antitrust Division of the U.S. Department of Justice with respect to financial instruments referenced to Euribor. S&C represents Barclays in the related civil litigation. The litigation includes class-action suits involving USD Libor, Yen Libor and Euribor alleging violations of federal antitrust laws and violations of the Commodity Exchange Act, as well as violations of the Racketeer Influenced and Corrupt Organizations Act and various state laws. Barclays, in the Enron securities class action—widely considered to be the most complex and largest securities class-action litigation ever—for more than nine years. The Firm’s defense strategy proved highly successful: The U.S. Court of Appeals for the Fifth Circuit reversed the class certification order. In March 2009, Barclays achieved a successful final result of that litigation, obtaining summary judgment from the district court dismissing the securities fraud claims brought by the class against Barclays and Barclays’ co-defendants, Credit Suisse and Merrill Lynch. Other financial institution defendants had settled these claims, agreeing to pay a total of $6.6 billion to plaintiffs in 2005. Boeing, in a securities class action brought by a putative class of Boeing shareholders related to Boeing’s 878 Dreamliner. Cablevision, in connection with class-action and shareholder derivative litigation in federal and state courts relating to “options backdating” allegations. S&C helped to facilitate a settlement of the “options” cases that resulted in a total value of approximately $34.4 million being paid to the company by its insurer and individual defendants and the dismissal of claims against the company and settling defendants. Gildan Activewear, in a putative class action alleging violations of sections 10(b) and 20(a) of the Securities Exchange Act following a downward reversion of the company’s earnings guidance and a drop in the company’s stock price by 30 percent. The court dismissed the action, noting that the plaintiffs failed to plead facts giving rise to a strong inference of scienter, in part because the insider sales on which the plaintiffs’ scienter allegations rested were not unusual in value, volume or timing. This was one of the first cases to establish a 10(b)(5)(1) plan as an affirmative defense against insider trading. Goldman Sachs, in investigations and related litigation involving residential mortgage-backed securities (RMBS) and collateralized debt obligations (CDOs). Both the DOJ and the SEC concluded lengthy investigations without taking action against Goldman Sachs or its employees. Recent litigation victories include a dismissal of fraud claims brought by an investor in a CDO offering by the Appellate Division, First Department of the New York Supreme Court; a dismissal of fraud claims brought by another CDO investor in a decision affirmed by the U.S. Court of Appeals for the Second Circuit; and dismissal of a shareholder derivative action by the Delaware Supreme Court that resulted in the dismissal of eight related derivative matters filed in the U.S. District Court for the Southern District of New York. Goldman Sachs, JPMorgan Chase, Barclays, Nomura and First Horizon, in separate actions brought by the Federal Housing Finance Agency (FHFA) on behalf of Fannie Mae and Freddie Mac. The cases are among 18 suits brought by FHFA alleging that the banks fraudulently issued or underwrote hundreds of mortgage-backed securities prior to the subprime collapse. Together, these cases constitute one of the highest-profile securities litigations arising out of the financial crisis, with hundreds of billions of dollars in securities at stake. Barclays, First Horizon, Goldman Sachs and JPMorgan recently settled these claims. A group of financial institutions, as plaintiffs in New York State Court in challenging the $5 billion restructuring of MBIA Insurance, including on a successful, precedent-setting appeal to New York’s highest court. JPMC, as national coordinating counsel in the company’s residential mortgage-backed securities litigation, which includes litigation arising from securitizations issued by Washington Mutual and Bear Stearns. As such, the Firm has responsibility for developing the strategy and overseeing more than 70 cases pending in multiple state and federal jurisdictions, as well as various regulatory matters. S&C played a key role in leading JPMorgan through its recently announced $13 billion settlement with the U.S. Department of Justice. JPMorgan Chase and its CEO and other senior officers, in achieving the dismissal of several derivative and Employee Retirement Income Security Act actions arising out of the so-called London Whale trading losses. Kohl’s Corporation, in obtaining the dismissal with prejudice of a putative securities fraud class action complaint brought by stockholders of Kohl’s against the company, its Chief Executive Officer Kevin Mansell, and its former Chief Financial Officer Wesley McDonald. Moody’s, in a coordinated shareholder class action. After defeating class certification, S&C obtained full dismissal on summary judgment of the actions brought against Moody’s that alleged that Moody’s made false and misleading statements concerning its rating methodologies and its management of conflicts of interest in connection with ratings of subprime residential mortgage-backed securities and other structured finance products that suffered downgrades during the financial crisis. The plaintiffs sought recovery for a more than 50-percent decline in Moody’s share price and the loss of more than $7 billion in market capitalization. 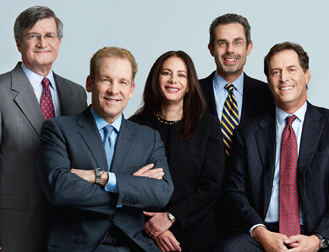 Leading banking associations, in obtaining a favorable ruling from the U.S. Supreme Court barring “scheme” liability under Section 10(b) of the Securities and Exchange Act in Stoneridge Investment Partners, LLC v. Scientific-Atlanta, Inc., which made clear that plaintiffs cannot seek to impose liability on secondary actors—such as investment banks, auditors and vendors—in a so-called scheme to defraud. Lewis Ranieri, a pioneer in mortgage finance and former vice chairman of Salomon Brothers, in obtaining dismissal of a securities fraud action, affirmed on appeal to the U.S. Court of Appeals for the Fifth Circuit. Porsche, in a high-profile federal securities litigation brought by a group of hedge funds seeking more than $2.5 billion in connection with Porsche’s acquisition of a stake in Volkswagen. The hedge funds’ claims were dismissed, and the United States Court of Appeals for the Second Circuit affirmed the dismissal. Both The New York Times and The Wall Street Journal reported on this victory. The American Lawyer noted in its March 2011 “Big Suits” column that the win “removes a roadblock to the planned merger between Porsche and VW.” The American Lawyer also recognized the Firm as an honoree for “Global Dispute of the Year: U.S. Litigation” in its inaugural Global Legal Awards (2013) for representation of Porsche in these matters. Regions Financial, in a class-action complaint brought against it under sections 11, 12 and 15 of the Securities Act of 1933. The plaintiffs asserted that the registration statement and prospectus for an April 2008 bond offering were false and misleading because they allegedly understated loan loss reserves and overstated goodwill. The U.S. Court of Appeals for the Second Circuit unanimously affirmed the district court’s dismissal, holding that Regions’ statements of goodwill and loan loss reserves were matters of opinion and estimation, not misstatements of material fact, and therefore were not actionable. The St. Joe Company, in a highly publicized putative shareholder class action brought under the federal securities laws concerning the valuation of real estate assets and disclosure issues. In 2013, the U.S. Court of Appeals for the Eleventh Circuit affirmed the dismissal of the case. UBS, in a variety of regulatory inquiries, investigations, tax matters, and private litigation arising from the recent financial crisis and losses related to mortgage-backed securities. Most recently, S&C advised UBS in obtaining the dismissal of all federal securities claims by UBS shareholders that acquired shares outside the U.S. arising out of UBS’s subprime losses. This decision, affirmed by the U.S. Court of Appeals for the Second Circuit, eliminated billions of dollars of potential liability. The victory established important precedent on the extraterritorial effect of U.S. securities laws. Vodafone, in a purported class-action securities fraud litigation alleging that Vodafone had misled investors by failing to timely disclose the impairment of the goodwill value of certain assets and the nature and extent of certain expected tax cash payments. The court dismissed the claims for failure to plead fraud with particularity and failure to plead a primary violation of Section 10(b) of the Securities Exchange Act. Volaris, a Mexican airline, and the individual defendants in a successful motion whereby the U.S. District Court for the Southern District of New York dismissed with prejudice all claims in a putative class action filed against Volaris, certain of its current and former directors and officers and certain underwriters of its IPO under Sections 11 and 15 of the Securities Act of 1933. 55 underwriting firms, in a groundbreaking decision that denied class certification in 306 IPO cases. S&C acted as liaison counsel for the firms. The Second Circuit’s opinion in In re IPO Securities Litigation set the stage for a favorable settlement that was approved in 2009. Sullivan & Cromwell played a key role in many of the high-profile securities suits arising from the financial crisis.